The quick and accurate answer is: any way you can imagine. On pasta—of course! In its home region, its used a lot on stuffed pasta. The locals say to “drown” the tortellini in butter, then “rescue” them with a generous “raft” of grated Parmigiano Reggiano. A simple dish of top quality pasta (we have many—Martelli, Rustichella, Faella, and more) cooked very al dente, then dressed with a great olive oil, a good bit of freshly ground pepper and a LOT of freshly grated Parmigiano Reggiano is totally a world-class meal. And you can make it in under 20 minutes from start to finish! Grated onto salads—this is an easy and really delicious way to take the quality of your salad up a few notches. Broken into small pieces and served with slices of Prosciutto di Parma—they’re from the same region and go hand in hand! Both are amazing! With honey—the best Parmigiano pairs beautifully with wonderful varietal honeys—I’m particularly partial to the sweet flavor of chestnut honey, but really any of the great varietal honeys at the Deli will be delicious. Taste, compare and enjoy! By the piece. This is probably how I eat more Parmigiano Reggiano than any other way. It’s super delicious and couldn’t be easier! Serve more than one Parmigiano Reggiano cheese at a time! With this wonderful new range of cheeses, one of the things I’m most excited about is the opportunity to serve three or four different Parmigiano Reggiano cheeses next to each other. Since each has its own flavor, mixing producers, seasons, etc. will make for a super interesting cheese board. Right out of the refrigerator the cheese will still be too cold to get its full flavor. Be sure to always serve your Parmigiano Reggiano at room temperature. When you’re using grated Parmigiano, be sure to grate it as close to the time you use it as possible. Pre-grating means the delicate cheese is exposed to air for far too long. Flavors and aromas get lost. In the same way you grind your coffee right before you brew, keep your cheese grinder close by and use it regularly. The aromas and the flavors of the cheese will then always be at their best! 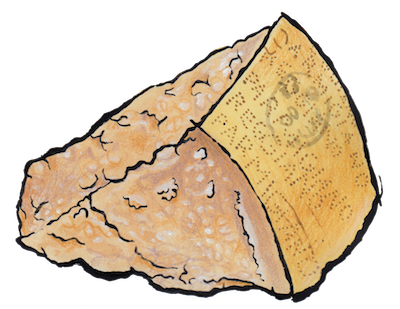 Perhaps most important of all—the best way by far to enjoy Parmigiano Reggiano is always to break it into small rough-texture pieces. The eating experience is significantly more interesting because you get more cheese exposed to your tongue. The uneven surface allows you to experience the cheese’s full complexity. By contrast, our “normal” American routine of slicing cheese with a knife leaves a surface that looks smooth but makes for suboptimal eating! Instead you’ll want to use the small, almond-shaped knives made especially for this purpose.